Everything happens for a reason while unconditional love starts from within. 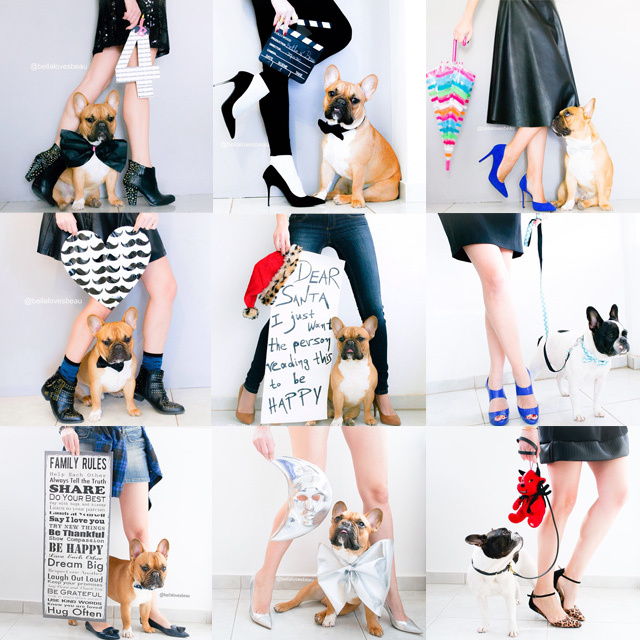 Meet Bella and Beau – the messengers of love – possibly and most likely, the two most adorable French Bulldogs in Athens, Greece. They love life and have a passion for fashion. Their stylish outfits and hilarious costumes are skilfully coordinated by their amazing Momager Alexandra who studies fashion and is fanatical about chocolate and dessert. Bella came into Alexandra’s life as a gift from a very special person. With Bella’s arrival, returned the smile on Alexandra’s face. She was blessed with Beau during a life changing situation. Beau’s presence taught Alexandra, how to listen and follow her heart. Bella and Beau are my life, my smile, my heart, my happiness, my personal motivation, my encouragement, my comfort, my family, my bests friends, my inspiration, my big loves, my hope, my joy, my lucky charms, my positive energy, my strength, my dreams,my sunshine, my sunrise, my whole world! They make me want to be a better person every single day. They teach me how wonderful it is to be yourself and how to love life, how to appreciate things that matter most in life, and how to never give up. They teach me that sharing is the most wonderful feeling. They make me see that even when whole world is collapsing, there is always a reason to be happy. They always make me laugh out loud. When I look into their eyes, it’s like a miracle happens, and I find my strength again. I don’t even remember how my life was before having them. Actually, I wonder why it took me so long to discover this magical world of dogs. I feel so blessed every single day because I know that when I hug them, the world is a better place… THEY ARE MY EVERYTHING! 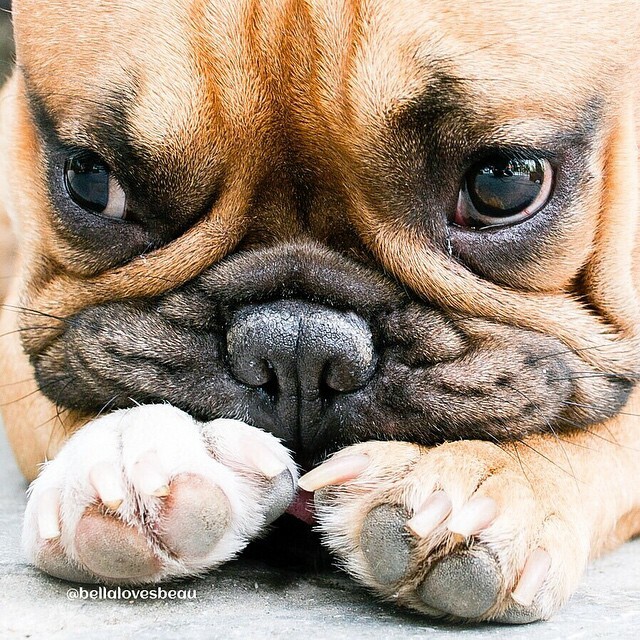 Besides the beautiful and colorful pictures of the adorable Frenchies, Bella & Beau’s profile is the ultimate source for inspiration. Every picture is decorated with a inspirational quote or a positive message that will brighten up your day. Their colorful account was included in Mashable’s article “30 Instagram pets that colored our world in 2014“. The best days are usually unplanned, random and spontaneous! I love you. I love you so much! I am so happy by the fact that everyday I wake up and I’m part of this precious and awesome community. You’re my sunshine, you make me happy when the skies are grey, you put the colors inside of my world! You’re one of the most beautiful things that ever happened to me! I have met so many very beautiful people through your platform and I’m blown away by all the love and support I receive each and everyday and they all, truly inspire me to do better on a daily basis! Always be yourself, unless you can be a Batman. Then always be a Batman! The rules for being awesome :  Risk more than required  Learn more than is normal  Be strong • Show courage  Breath  Love  Laugh  Cry  Simplify  Be kinder than expected  Deliver more than is needed  Shatter your limits  Transcend your fears  Inspire others by your bigness  Dream big but start small  Don’t stop. There is one more thing I’d like to mention about Alexandra. Actually, two things – her beautifully shaped, long and glamorous legs that she stages in cooperation with Beau and Bella for showcasing her stylish skirt and shoes ensembles. These creative shots are Alexandra’s most favorite. Them legs could have an Instagram account of their own but Bella and Beau don’t approve. I just want the person reading this to be happy! For more happiness, head straight to bellalovesbeau profile on Instagram.